After two unsuccessful attempts at achieving the sound they had hoped for with their first two albums in their Synth Era, Rush teamed up with producer Peter Collins and headed off to his native London to record “Power Windows”. Peter Collins had an eclectic resume, working with everyone from Alice Cooper to Tracey Ullman, and he indulged the band’s wilder impulses, including choirs and string arrangements for the first time. Knee deep in synthesizers now, fans at the time complained that the digital production of “Power Windows” sounded too cold, and Alex’s guitars were too bright to really “rock”. 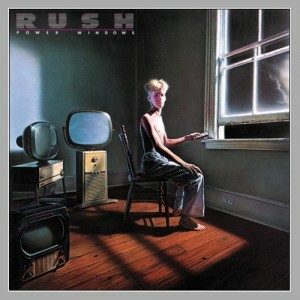 Personally though, “Power Windows” perhaps stands as my all-time favorite Rush record. “Moving Pictures” and “2112” are, of course, more seminal works and are more iconic, but even amongst the band’s synth-based material, “Power Windows” sounds unique. Though the songs and production run with digital precision, there’s a passion and spontaneity in the performances that make tracks sound very energetic and exciting. Alex’s guitars may not distort often and don’t have a lot of “oomph”, but this album contains some of his wildest playing and he goes for broke on the whammy bar, making just a simple power chord epically reverberate through the song. The album bursts out the gate with “The Big Money”, Alex’s guitar demanding your attention while Geddy’s keyboards chime in from the periphery. The song then builds up the excitement with a rapid, sequenced keyboard pattern before Geddy launches into the first verse. “Big Money” features some of Neil’s simpler lyrics, but they’re fun and get their point across about the sheer power and influence of global conglomerates (something that resonates now more than ever). Alex’s solo starts off quiet this time before building up in volume and intensity, leading to a great pay-off. The studio version just fades out, but live versions have ended a variety of ways, like with the riff from Cheech and Chong’s “Earache My Eye” or a sample of “The Simpsons”. That’s also what I like about this album and this era: aside from expanded sonically, the band also started to embrace their sense of humor and started taking themselves less seriously. “Grand Designs” opens with what can be best described as “sequenced chimes”, and the sequencers are all over this song (and most of the album now that I think of it). With the lyrics singing of good things happening through time and effort, I almost feel like its Rush describing it’s aims in the long run. The solo is absolutely glorious, and Geddy’s multi-tracked vocals during the outro absolutely soar. This is another personal favorite and another ringtone song for me, along with “Red Barchetta” (have you noticed yet I’m a huge freaking nerd?). “Manhattan Project” is Rush’s first straight historical song in quite some time, but unlike “Bastille Day” (which naturally focused on the French revolution), it focuses on the building and eventual dropping of the atomic bomb in World War II (“a weapon that could settle the score”). The song is simple and brooding during the verses, but pick up around the chorus when Geddy sings about “the big bang/that took and shook the world”. The string arrangements for the album really shine during the bridge when they merge with Geddy’s keyboards after they describe the Enola Gay dropping the bomb on Hiroshima. At this point, it doesn’t so much seem like the composition is trying to match the dropping of the bomb (since that’s already happened), but more the tension and fear that spreads throughout the world as the nuclear arms race begins. My only complaint is that Alex’s guitar solo feels a bit tacked on at the end, and doesn’t really add much to the song. Other than that, it’s one of Rush’s best historical songs, and I’d genuinely refer it to people who want a crash course on the history of nuclear warfare. Side one ends with “Marathon”, one of my top five, all-time favorite Rush songs. Whereas “Grace Under Pressure” was all about doom and gloom, “Power Windows” is all about energy and adrenaline, which this song best exemplifies. While Geddy’s bass dominates the verses and his keyboards dominate the chorus (seriously, Geddy plays like a beast on this song), Alex is going wild in the background all the while. Even the solo is good, slowly building in energy with multiple sections. The lyrics are some of Neil’s best from the Synth Era, using a marathon as a metaphor for getting through life’s hardships, because: “You can miss a stride/But nobody gets a free ride”. “Territories” starts with a lighter touch, with Neil’s fluttering hi-hat and pounding kick drum before Geddy’s keyboards come in. Alex comes in with some almost bluesy playing before things explode by the first chorus though, showing perhaps one of the few times Alex’s guitar has been pitch-shifted (though I can’t confirm this). This is another high energy number, the lyrics decrying nationalism and xenophobia, instead suggesting “Better the pride that resides/In a citizen of the world” and offering “Better people/better food/and better beer!”. Not hard to get behind that, is it? Rush has their priorities in place, people! “Middletown Dreams” begins with more sequencers and Neil’s electronic drumming. The lyrics and guitars here are at their most evocative, the cold production creating a stark landscape of suburban loneliness and desire for escape. “Dreams transport desires/Drive you when you’re down”, though “life’s not unpleasant in their little neighborhood”. This song perhaps best captures how there’s few concerns in the suburbs, but that doesn’t stop our hearts from longing for more. “Emotion Detector” is a bit of a weak link for me. Again, it goes back to my issue where Rush writes effective sci-fi songs until they actually try to write actual sci-fi songs. Neil’s drums and Alex’s solo are really good on this track, but the lyrics are a bit too clumsy for me. Not bad, but easily the weakest track on the album. Neil’s drums have really impressed throughout this album, so it’s fitting they take center stage for the final track, “Mystic Rhythms”. Geddy’s keyboards go for the low choir this time, creating an appropriate mystic tone. Alex doesn’t get a traditional solo, instead indulging in some trippy reverse delay. The lyrics don’t so much talk about spirituality as a pondering of what we don’t know (“unseen and unexplained”), which can include any number of things really. It’s a big open-ended question about the unknown to listeners of any creed or background, and shows how Rush looks at the big picture. I can see why fans of Rush’s older material wouldn’t like “Power Windows”, but it’s so dense I find it a thrill to listen to, and I always seem to find something new every time. It showed the band could have a really “modern” sound, but still be passionate and exciting instead of bland and dull like a lot of pop music then and now. While Geddy’s keyboards are the definitely dominant instrument here, I still really recommend drummers listen to this album, because it has some of Neil’s most diverse and dynamic playing.